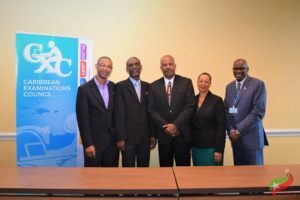 Basseterre, St. Kitts – The Caribbean Examination Council (CXC) held its 49th meeting at the St. Kitts Marriott Resort Dec. 15, which has essentially paved the way for the further development and transformation of CXC. The council meeting was held under the chairmanship of Professor Sir Hilary Beckles, chairman of CXC and vice chancellor of the University of the West Indies. At a press conference held after the meeting, Sir Beckles said that the meeting will be remembered for its celebration of the brilliance of the students who have excelled and broke records of achievement and academic performance. This was in reference to the Regional Top Awards Ceremony held Dec. 14 at the St. Kitts Marriott Resort. He added that it will also be remembered for the affirmation of the need to “transform the CXC to one of the most technologically advanced and robust institutions in the region, if not in the world. “As you all are aware, we have moved expeditiously to increase the efficiency of our procedures and our business activity, and we have gone aggressively into the business of marking, testing and monitoring electronically, so that CXC is now clearly an institution that is distinguished in terms of its technical efficiency,” said Beckles. From a developmental point of view, said Beckles, CXC was able to indicate that its syllabuses and programmes are designed to achieve two fundamental objectives: equity within the society for the different categories of students, and students who are also involved in academic streamed programmes, and technical and vocational programmes. “No child left behind remains the vision,” he said. It was said that syllabuses “have all reached a level of alignment with the specific needs of Caribbean peoples and our economies. Beckles stated that CXC has enhanced its relevance in terms of economic transformation and diversification, but at the same time it has paid close attention to how all citizens should be taken care of around the principle of equity and justice. Permanent Secretary in the Ministry of Education Vincent Hodge said that it was an honour for St. Kitts and Nevis to host the meeting. Hodge extended his gratitude to Solomon Claxton, local registrar, for making the meeting a success. He also thanked Claxton’s team for making sure that the arrangements for the council meeting were adequate. St. Vincent and the Grenadines has offered to host the 2018 CXC governance meetings.